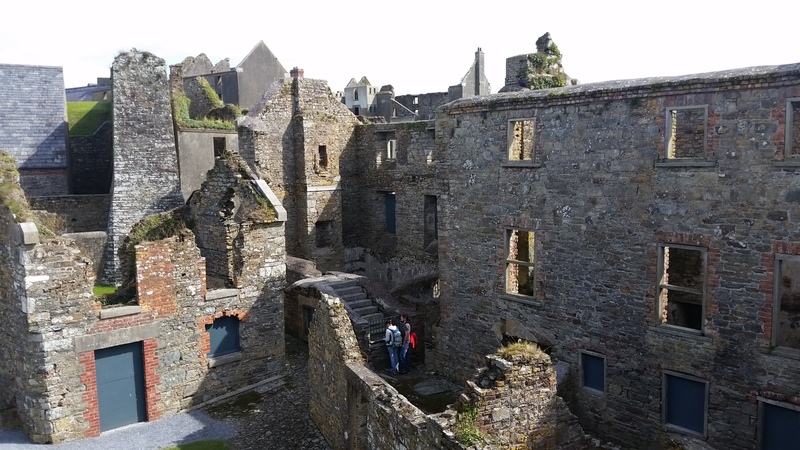 I can’t talk about my time in Ireland without talking about Guinness. I might as well have eaten at a Michelin-star seafood restaurant and told you all about the bread basket. 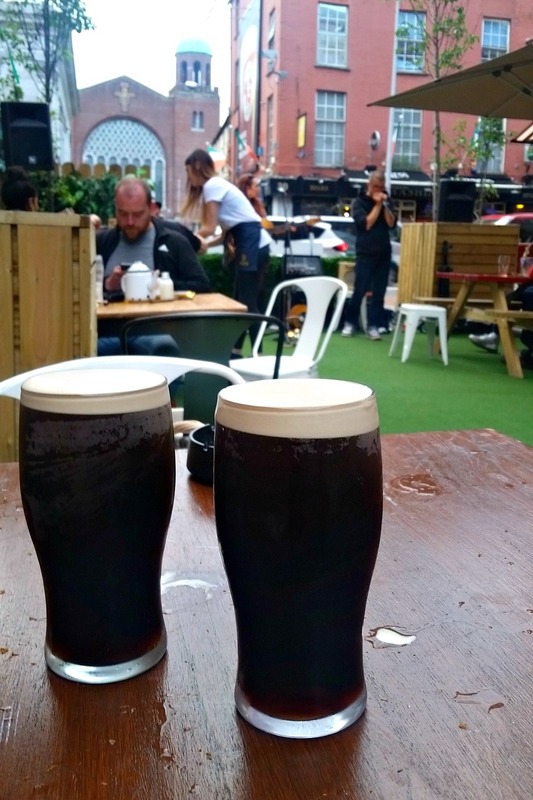 According to the friend I was visiting in Cork, there are two things you cannot visit Ireland without trying: the chocolate, and the stout. Now, I was all for the chocolate (obviously), but Guinness? Beer? Stout? Hops? Imperial pints in the UK/Ireland are huge and I had never drunk so much as a can of beer before visiting Europe (the taste of beer reminds me of that nasty Chinese herbal medicine we used to drink as kids), so I felt a bit nervous about what I’d do when faced with a whole glass of that dark, intimidating liquid. 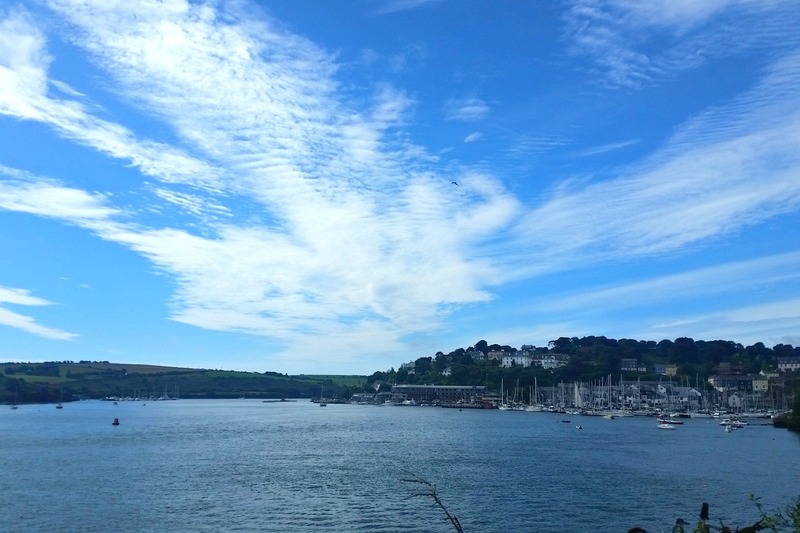 All the same, I certainly hadn’t come halfway across the world to sip on sparkling water–so when Alex proposed that we go out for a couple of rounds at the local pubs, I was ready to give Guinness my best shot. Verdict: Turns out, I am actually a fan of the well-poured Guinness! Alex explained the process to me while we waited for our bartender to finish pouring,* then we found seats outside and enjoyed the live music wafting through the town streets while we sipped on glasses that were nearly overflowing with creamy white head. We later met up with a group of his school and university friends, who were probably the friendliest folks in the northern hemisphere and made me feel absolutely welcome. Of course, the second pint of Guinness probably helped! Best of all, Alex and I got home the first night at 1 AM, poured ourselves some cereal with milk, and watched Louis Theroux documentaries into the wee hours of the morning before we were too tired to stay up any longer. Keepin’ it low-key classy in Ireland! Given how memorable a time I had experiencing pub life in Ireland, it would have been ungrateful of me not to blog about this Chocolate Guinness Cake. 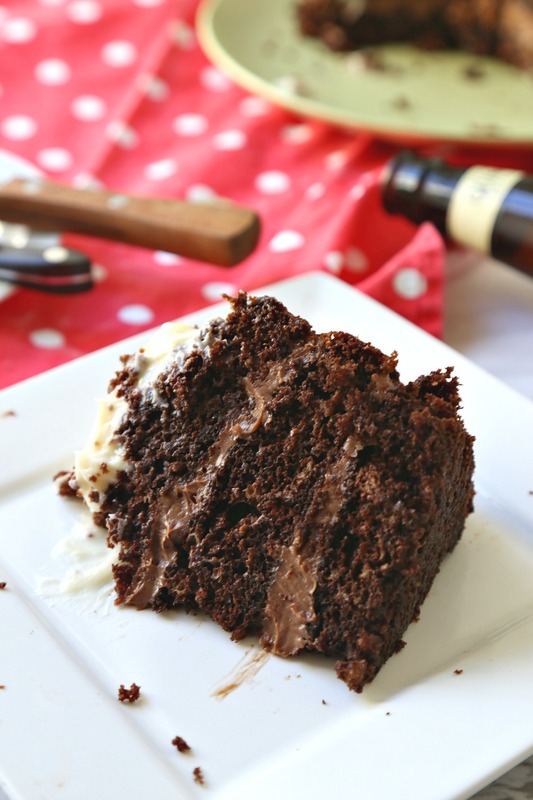 If you didn’t already know, extra stout beer has a deep, rich taste that pairs perfectly with chocolate: I added just enough in this recipe so that you can taste it, but it doesn’t overwhelm the chocolatey goodness of the cake itself. That being said, the two frostings that this cake uses–a regular cream cheese frosting and a stellar chocolate cream cheese frosting—bang on make this cake awesome. Multiple people have sworn to me that it’s the best frosting-in-a-cake that they’ve ever tasted, so don’t skip on them! This cake is moist, richly chocolatey, and definitely in the top 5 cakes that I have ever made. In the next few posts I’ll be sharing some of my adventures from southern Italy, as well as the incredible food (OMG THE FOOD) that we encountered there, so stay tuned! Do you have any Guinness stories to share? 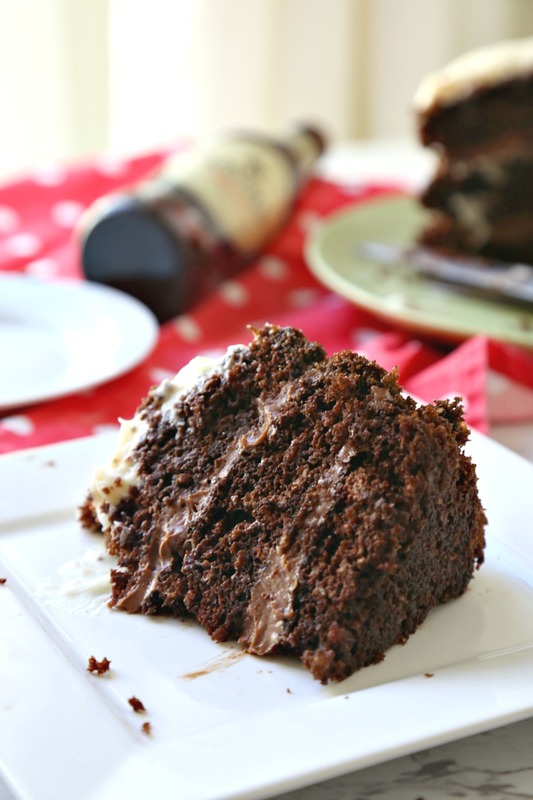 This Chocolate Guinness Cake is absolutely incredible: the deep, rich flavors of extra stout beer bring out the chocolatey-ness of this 3-layer cake. 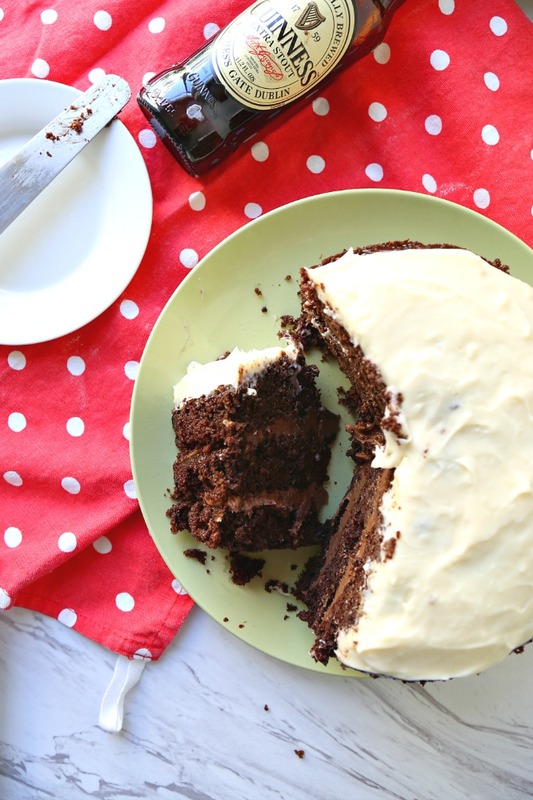 Don't skip out on the two frostings, either: cream cheese and chocolate cream cheese frostings are the key to this amazingly moist, tangily-balanced cake! Preheat oven to 350 degrees F. Lightly grease 3 8-inch round springform pans and set aside. In a saucepan, combine Guinness and butter. Heat on medium until butter melts, then turn off heat and stir in cocoa powder and sugar until sugar has dissolved completely. In a separate bowl, cream together yogurt, eggs, and vanilla. Add mixture to Guinness blend and whisk in as well as possible. Add flour, baking soda, and salt; whisk again until smooth. Divide batter between three prepared pans. Bake in preheated oven for 18-23 minutes, until a toothpick inserted in the center of each comes out mostly clean with moist crumbs clinging to it. Meanwhile, prepare frostings. In a medium bowl, cream together cream cheese, butter, and Greek yogurt until smooth. Add sugar one cup at a time; whisk until smooth. Mix in vanilla. Spread frosting on one layer of your layered cake (I used cream cheese frosting to cover the top of the cake). In a medium bowl, cream together cream cheese, butter, and Greek yogurt until smooth. In a microwave-safe bowl, heat chocolate chips at 15-second intervals, stirring between each interval, until melted and smooth. Add to cream cheese mixture and beat in until smooth. Add sugar one cup at a time; whisk until smooth. Mix in vanilla. Spread frosting on one layer of your layered cake (I used cream cheese frosting in between the middle two layers). Â© Wallflour Girl. All images and content are copyright protected. Please do not use without prior permission. If you would like to republish this recipe, please link back to this post. Absolutely fantastic chocolate cake! I agree, the Guinness adds depth to the chocolate, more so than the addition of coffee. Keep up the summer travel posts, the dessert inspiration is amazing! Absolutely, I never thought anything could beat coffee in a chocolate cake! And THANK you, that means a lot, Deb–I’m really excited to keep up the summer adventure tales! yesss, it’s SUCH a good combo! I’d serve you up a slice right now if I could 🙂 cheers, Heather! Guinness is good stuff. Love it. Never have been to Ireland — I should go just so I can sip some at the source. 🙂 Good cake, too — thanks. Yes, it is SO different there than the stuff you get here. Do it, John! I have a Guinness cake back in the bowels of my archives and it looks nothing like this!! Think I need a remake—love your moist, decadent, multi-layered version!!! I’m definitely going to have to give this a go. 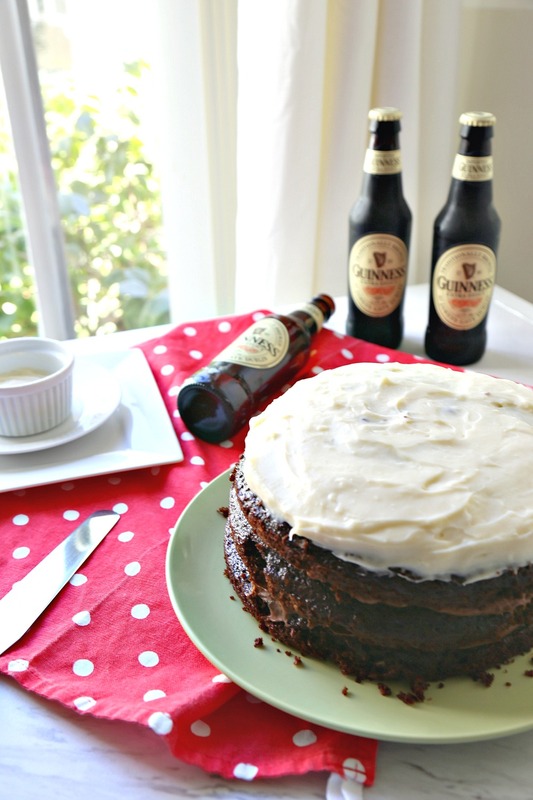 I’ve had a Guinness cake once before and it was divine, but never had the courage to bake one myself! Can I make this without Guinness? What would I replace it with? Most likely! I haven’t tried it, but coffee could be a good substitute. You could also try substituting another liquid like milk. Let me know how it goes if you give it a go, Danny! That’s it! 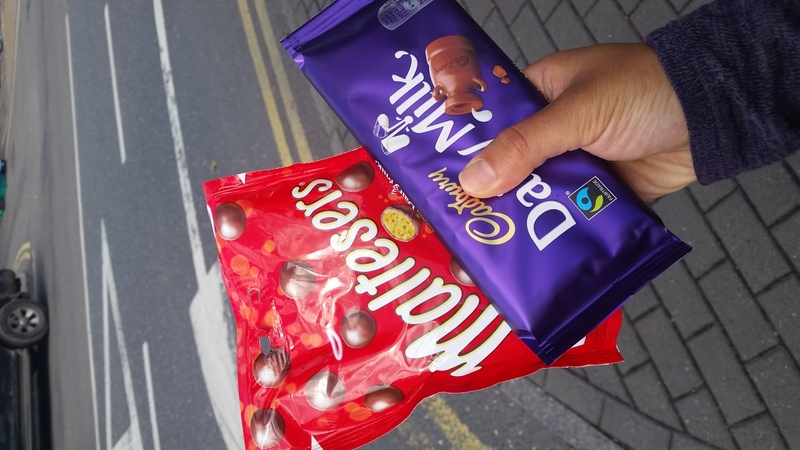 I’m moving to Ireland so I can get the best of both worlds: chocolate and beer. Not sure if I need anything else after that, but for now…this chocolate cake looks so tempting. I’m all about chocolate so I can’t pass on this on. YESSS can you take me with you please, Linda?!? I can’t wait to go back! Holy moly, Ala! I am drooling… It is 11 pm here and I really don’t know how I am gonna be able to sleep without having a big slice of this super moist and delish cake. I am a big fan of Cadbury chocolate! Omg. Ala, this cake looks soo amazing and soo decadent. I have a feeling I’m going to eat most of this cake on my own. You got me at chocolate. I have no Guinness stories to share but it is very popular at home. And so are those dairy milk bars!!! My whole childhood revolved around him. I am so jealous of your wonderful trip!! OH MAN this looks amazing. I’m typically not a huge fan of the super-rich dark beers like guinness for drinking, but in baked goods or bread, I think they have so much to impart. I’d love to try it with a guinness ganache! 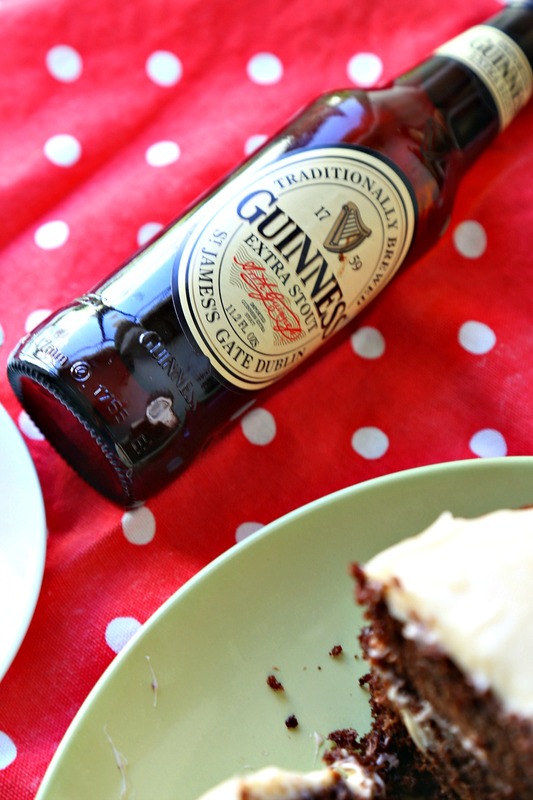 GUINNESS GANACHE–girl, get in my kitchen right now because I need your creative brains!! That sounds amazing. Or a Bailey’s frosting, perhaps?? 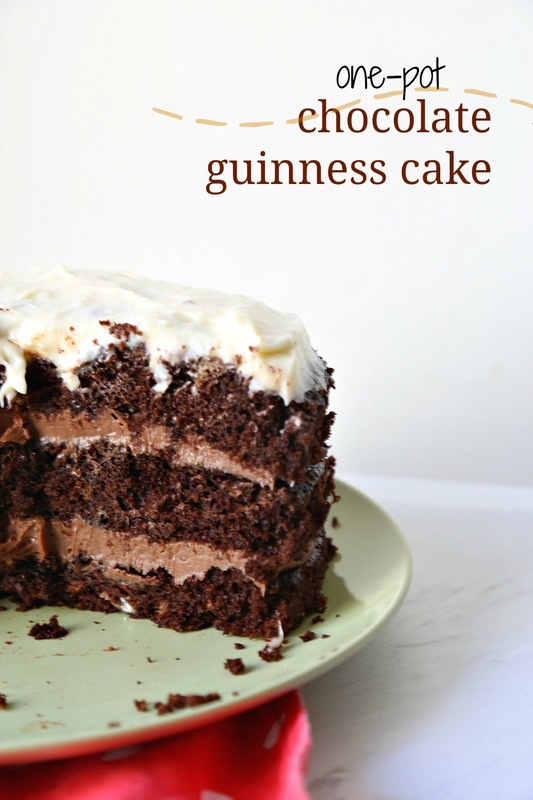 I haven’t had Guinness in so long and this cake would be the perfect way to start!! Looks so freakin’ good! What a delicious combo with chocolate and beer 🙂 Would love a big piece of that right now! You can bet your stretchy pants that I would send you a big slice if I could right now, Dawn!! Guinness + this cake = HEAVEN. Hope you have a wonderful week! Oh Wow – Ala – this is MARVELOUS! I am not a huge fan of Guinness, beer or hops or what not – but gosh darn it – I’d become a fan of it in a hurry if I could always have it in a decadent cake like THIS! You did a wonderful job and I cannot stop drooling over how moist this cake is and how ooey goey just plain lick-able that frosting is! …drink as the Germans do?? Omg did you manage it?? Because I seriously could not keep up with the British, I will tell you that. Sad times. But DO Ireland!